Assomac's association with WAI is pretty long. The company had always been in touch with the activities of the Wire Association International, playing a pivotal role in bringing up the WAI – India Chapter, and also in organizing the Wire Symposium in New Delhi (India) in the year 2005. 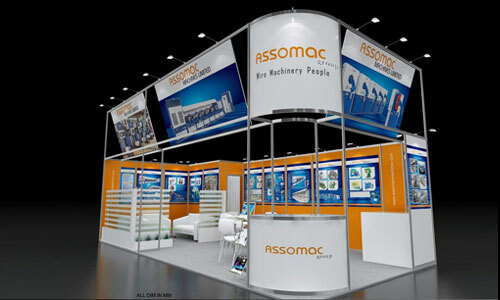 Beside this, Assomac had been regularly taking the delegation of Indian Wire Industry people to various shows in Düsseldorf (Germany) and to various parts of the world. This time, the Indian company is exhibiting at Interwire 2015, being held in Atlanta (USA) on April 28 – 30, 2015. This show, organized by WAI and held in conjunction with WAI’s Annual Convention, is hosted biennially, and includes exhibiting companies, speakers and visitors from more than 50 countries. Wire industry professionals looking for new wire and cable technologies, machinery and other additional equipment will attend Interwire, the benchmark for wire business in America. The event involves dozens of vertical industries including automobiles, construction, cable manufacturing, aerospace, transportation, communications and many others. Assomac looks back with fond memories on participating in the first wire show in the year 1992. It was Wire Düsseldorf in Germany, a major milestone in the company’s history. Since then, these trade fairs allowed Assomac to show groundbreaking innovations in its vast range of wire & cable manufacturing solutions for sustainable and efficient manufacturing. The global provider of turnkey solutions for wire manufacturing, now exporting to more than 25 countries, has always presented many technological innovations during these shows, including straight line machines, wire ribbing lines, rod break down machines, inverted drawing blocks (IVD) as also other turnkey projects. These new generation machines manufactured by Assomac are faster, with systemized electrical control drives and less settings, giving customers a quicker return. With the Indian economy opening up with the change of government, and the warm relations India & U.S. enjoy at present, it's the perfect time for Assomac to participate in this show. The company has been regularly participating in wire Düsseldorf and other wire-specific shows. The "Wire" exhibitions provide a platform to interact with existing customers as well as prospective ones, plus they enables to showcase the new developments. According to the declarations of the company: "At a single venue, we can have our good networking, establishing goal friendships with wire professionals. Over the past, we have successfully connected with active buyers and important decision-makers in the wire & cable industries." Assomac looks ahead to the date with Interwire 2015, to present its manufacturing range to prospective customers, generating business development, industry knowledge, cooperation, by sharing experiences and ideas in the wire field. 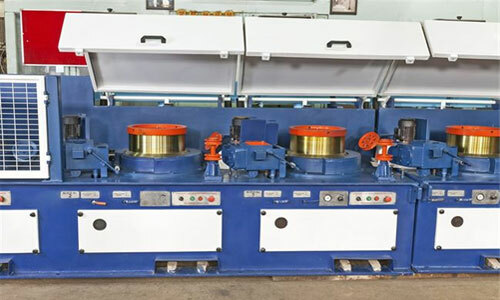 Assomac Machines Limited., India-based company, is a known name now in manufacturing plants and machines for making wire, cables and other related machinery. Assomac develops and manufactures machines according to customers' requirements, catering successfully to the requirement of large, medium and small scale sectors of this industry across the globe. Assomac is ready in absorbing the new technologies rapidly to meet this growing market in India as well as evolving global standards for efficiency and sustainability. Assomac has recently carried out an export project in the Middle East Countries for an advanced high speed cold ribbed bar line, for manufacturing 14 mm – 4 mm. finish range with a speed upto 12 mtrs./sec. which is capable to produce 4000 to 5000 MT/month of finished ribbed wire in different diameters (see picture). The company has recently bagged a big export order for a turnkey project for a wire drawing and galvanizing plant. For the first time, Assomac would supply a high speed galvanizing line with a combination of nitrogen & pad wiping to facilitate both heavy and medium commercial wires with complete wire drawing set up. Assomac Group is engaged in the design and development of cost effective and highly efficient machinery to the wire Industry. Regarding the slowdown in the overall economy of the world, Assomac observes that though the market conditions puts lots of pressure on business, as far as their business is concerned, the customers' trust always comes to rescue and increases, year after year. Customers remember Assomac because they trust the company and have faith in the quality and technology of the products. The Group has its own R&D facility which maintains strong technological advances from time to time. Assomac always strives for ongoing technological improvements in the machines. This helps to provide customers with advanced solutions to meet and even exceed their requirements. In the past, Assomac has created its own history in the domestic sector in supplying many high value added stainless steel wire Plants, MIG wire plants etc. which are running trouble free. Recently the trend has changed in the wire industry towards investing in new and more modern machinery, and this has helped to get more market share. On the social front, the company’s desire to respect the environment is evident from the fact that the vast extra land has been used for planting more and more trees for making a healthy environment in the surroundings. The company has also recently invested heavily in the equipment to control emissions for the overall health of the human kind. Assomac is looking forward for further growth in the coming years and reach even the unexplored markets. 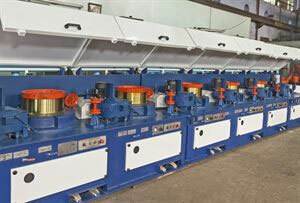 Assomac Group has established itself as one of India’s leading names in the field of wire machinery manufacturing. Assomac has indeed come a long way with you, with more than 1000 projects executed for the core industry, the company has shown to have the skills to transform its vision in reality. This has happened so, because Assomac understands the value of the customer’s investments and respects it by delivering a pre-engineered wire building solution that matches its commitments and the customer’s needs. Assomac offered to customers a complete range of high speed state of the art sturdy straight line and fine wire drawing machines for high production, high quality drawing of wires which lowers operator interference. Assomac has pioneered to indigenously develop the straight line wire drawing machine technology in India. The range of machines varies from capstan diameter 1200 mm down to 300 mm for inlet wire diameter 40 mm down to 0.7 mm and up to 0.30 fine wires having line speeds up to 25 mtrs./sec. These machines provide remarkable drawing performance for low, medium & high carbon steel wire, stainless steel wire and special alloy steel wire as well as non-ferrous wires. With such high technology machines, Assomac has indeed brought a revolution with the wonder material known as stainless steel. There has been a great increase in the manufacturing of stainless steel sire in India and Assomac has played its own role. The company has educated many customers, right from the beginning, to the use of stainless steel, attempting to stop the process of consuming our own planet by promoting the production of SS Wire. This wire has quickly become the material of modern progressive world in such a short time. Can you believe that the global economy loses over US$ 2500 billion every year on account of corrosion? The increase of stainless steel has downsized the loss to a great extent. S.S. Wire has already established itself in sectors like automotive, railway & transport, building & construction, chemical & petrochemical industry, kitchenware and food processing Industry. Stainless steel products contain at least 60% of recycled content, which is why stainless steel has rightly been called the "Green Metal". Assomac is proud of the fact that that largest chunk of stainless steel wire is being drawn on its machines and of its relentless efforts to promote the use of stainless steel, through its machines. Meet Assomac Machines at WIRE & CABLE India 2014, on October 28-30 in Mumbai (stall no. 1A01 in Hall No. 1). Assomac Machines Limited. India based company produces innovative and technologically advanced machinery both for ferrous and non-ferrous wire industry. Assomac is now a name synonym to the wire industry. The company adopts and practices the international quality standards to deliver high quality machines to the industry. The machines produced by Assomac have always attracted customers and has received many awards in both National and International arenas. International Quality Machines, Timely Delivery, and Latest Technology lay the foundation for the growth and popularity of Assomac. These attributes have led to the successful export of Assomac Machines across the globe. 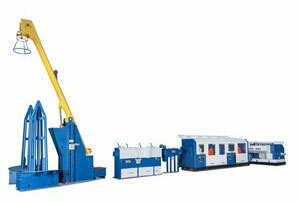 Assomac Machines are successfully installed in Europe, Middle East, African Continent, S.E. countries and many more. The company has a 250,000 – sq. ft. production facility where all in-house components are manufactured, assembled and tested as complete machines. The company is situated in NCR (National Capital Region) in the outskirt of New Delhi. With the changing economic condition of the world, India is being targeted as a high growth area of the world & lot of foreign players are making India as a base for their activity. There is a spurt in the growth of Steel Wire Sector as well as Indian Cable sector. The Indian Cable sector clocked unprecedented growth of 60% due to a 200 percent growth in the control cable segment. On one hand there is a huge opportunity presented by the mandated “Electricity for all by 2014” in India and yet there is challenge of meeting this inspiring goal within the stipulated period. Assomac is ready in absorbing the new technologies rapidly to meet this growing market in India as well as evolving global standards for efficiency and sustainability. On display would be components having coating done in house by High Velocity Oxygen Fuel (HVOF) Coating system to give the important components a long life besides leading to a very smooth surface finish of wire. Assomac has procured the plant from Sulzerrmetco & ABB (Robotic Thermal Spray Coating Process). Besides this we would be displaying the literature, product information and the innovations made by the group. Assomac Machines are easily integrated for any manufacturing operation both for ferrous and non-ferrous wire and can be tailored to your requirements. Please visit our booth to see our potential & what we can offer to you. We are confident that we can offer to you top quality machines at affordable cost. High Velocity Oxygen Fuel (HVOF) Coating is a Thermal Spray Coating process where oxygen & fuel gas are ignited in particular atmosphere. This process is used to improve or restore a component’s surface properties or dimensions, thus extending equipment’s life by significantly increasing its resistance to wear, corrosion & erosion. Molten or semi-molten materials are sprayed out to the surface by mean of high temperature, high velocity gas stream, producing a dense spray coating which can be ground to a very high surface finish. The utilization of the HVOF Coating technique allows the application of coating materials such as metals, alloys and even ceramics to produce a coating of exceptional hardness & thus giving substantial resistance to corrosion & wear. Improves the performance of the component. Enables the components to operate within Harsh Chemical environments. Enables the components to operate in higher /lower temperatures. Improves life of mating components. As with all Thermal Spray Coating processes, HVOF Coating material is heated& accelerated by a gas stream to a component’s surface, to attain better properties. With the HVOF Coating process, the gas stream is produced by mixing & igniting oxygen & fuel (gas or liquid) in a combustion chamber & allowing the high pressure gas to accelerate through a Thermal Spray Process. 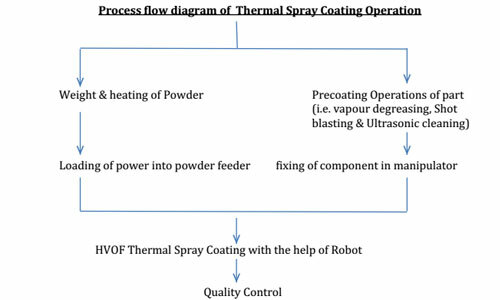 The following process instructions are intended for use as a guide, for coating of carbide powders using “HVOF” Thermal Spray Coating. The instruction contain the list and description of production techniques and operation needs to accomplish the process of applying Thermal Spray Coating on components as well as the list of main types of coating defect and their remedies. In recent years, high velocity Oxy Fuel (HVOF) Spraying has been considered an asset to the family of Thermal Spray Processes especially for the materials with melting point below 3000°C to 3300°C. It has proven successful since it shows advantages in density and bond strength making it attractive for many wear and corrosion resistance applications. Its high coating quality results from the use of a hot combustion & new high speed gas jet for thermal spraying. These coatings have environmental advantages compared to chemically / electro-chemically formed coatings. Tungsten Carbide based powders are widely used in the HVOF Spraying System. These are used to produce dense, high hardness and excellent wear resistance coatings generally to combat the erosion and corrosion occurring in hydro power plant and pumps wire industries. In applications where abrasive or corrosive wear resistance is of primary importance. Wc-co (Tungsten Carbide) with and without nickel or chrome is used. HVOF Spraying does not have these limitations. HVOF Thermal Spray coating has a mechanical bond. The bond strength can be of high or 12000 psi, which is attained by the high kinetic energy of the particles. Thermal Spray Coating is an attractive technique as it offers a wide choice of materials & processes that have a reduced impact on the environment when compared to conventional plating processes as explained above.